Early agrarian women—like these murdered in what is now western France some 6500 years ago—may have been critical manual laborers in their societies. Prehistoric women shouldered a major share of the hoeing, digging, and hauling in early agricultural societies. Forget about emotional labor. Women living 7000 years ago had to deal with another lopsided workload: farming. Prehistoric women shouldered a major share of the hoeing, digging, and hauling in early agricultural societies, according to a new study. Now, by analyzing the bones of these women, scientists have shown that their upper body strength surpassed even today’s elite female athletes. The findings refute popularly held notions that early agrarian women shunned manual labor in favor of domestic work, and they suggest that then—as now—a woman’s work was never done. Bones stretch and twist throughout the lifetime in response to repeated stresses like lifting, pulling, and running. When humans switched from a roving hunter-gatherer lifestyle to a more sedentary, farming-focused existence some 10,000 years ago, their bones followed suit: The rigid, bent shinbones of men found in central Europe between 5300 B.C.E. and 100 C.E.—shaped by muscles constantly on the run—became progressively straighter and less rigid as people farmed more and roved less. But women’s shinbones didn’t change much during this same period. Some have put that down to prehistoric women’s focus on domestic tasks that required comparatively less strength. But Alison Macintosh, an anthropologist at the University of Cambridge in the United Kingdom, thought there might be more to the story. 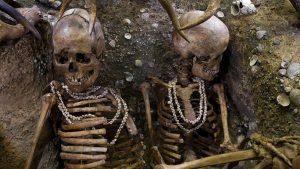 “We felt it was likely a huge oversimplification to say [prehistoric women] were simply not doing that much, or not doing as much as the men, or were largely sedentary,” she says. To find out what was really going on, she and colleagues used a 3D laser imaging system to record models of 89 shinbones and 78 upper arm bones from women who lived during the Neolithic (5300 B.C.E.–4600 B.C.E. ), Bronze Age (3200 B.C.E.–1450 B.C.E. ), Iron Age (850 B.C.E.–100 C.E. ), and Medieval (800 C.E.–850 C.E.) periods in Central Europe. Then they recruited dozens of female Cambridge students—accomplished runners, soccer players, and rowers as well as moderately active nonathletes—and x-rayed their leg and arm bones using a computerized tomography scanner. Analyzing the bones’ shapes, they looked at the bends and twists that indicated how much muscle was packed on, then compared them with those of their agrarian foremothers. Macintosh found—similar to previous research—that throughout the ages, women’s leg strength has remained largely the same. But when the researchers looked at the upper arm bones, a new pattern emerged: Prehistoric women in the Neolithic, Bronze, and Iron ages would have had about 5%–10% more arm strength than the modern female athletes in the study, the researchers report today in Science Advances . In fact, the prehistoric women’s bodies most closely resembled those of modern rowers, who specialize in repetitive, unidirectional pulling strength. That’s the same kind of strength needed for digging ditches, heaving around crop baskets and equipment, and grinding cereal grains. Among the prehistoric women, there was also more variation in strength than in modern women. That means that in these early agricultural societies, women likely specialized in various kinds of heavy manual labor, says Macintosh, whereas men split their time between farming and more lower body–intensive tasks like running and hunting.The findings are convincing, says May, and may help explain why bone diseases such as osteoporosis are so common in women today. Evolution may have shaped women’s bone structure to deal with the stresses of life on the move during hunter-gatherer times, and the rapid shift to a more stationary, farming-focused life might have led to weaker bones. In future studies, though, she would like researchers to look at the nutritional changes that happened after the agricultural revolution. Eating less meat and more grains and vegetables might have also helped shift bone and muscle strength, she notes. Another unanswered question, says Macintosh: precisely how ancient men and women split up the chores. Originally published by the American Association for the Advancement of Science, republished with permission for educational, non-commercial purposes. This entry was posted in Agriculture, Ancient, History, Prehistoric, Prehistory, Women. Bookmark the permalink.